In our lab, we frequently hear “does anyone have extra acetone? IMS? White spirit?” Here, the solvents do not mean just solvents, it actually means a solvent dispenser filled with a specific solvent. Why is this such a frequent problem? Let’s find out the reason and sort it out! Solvent dispensers have been used in conservation labs for some time. These are pump action bottles that allow the controlled use of solvents during lab work. There are many advantages to using these dispensers. 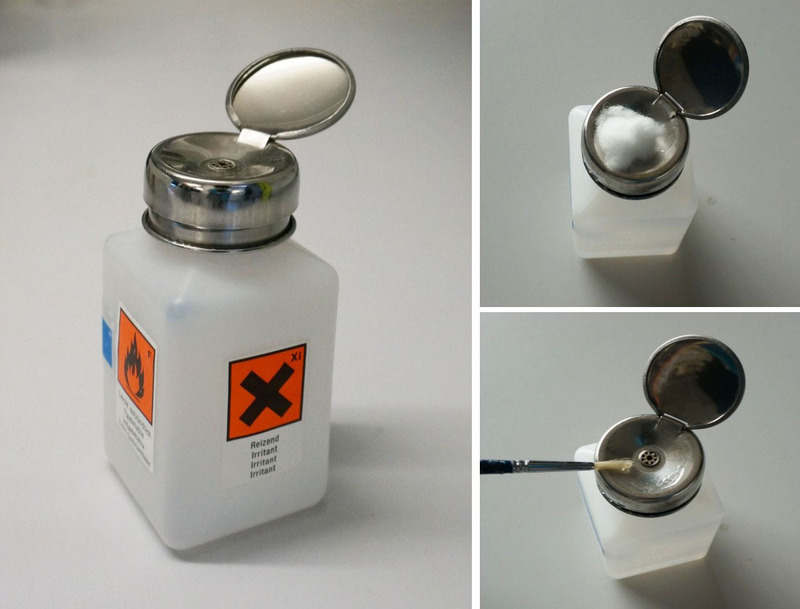 Firstly, it makes the controlled application of solvent to cotton wool swabs or brushes much easier, without contaminating the rest of the solvent . The pump on the dispenser transfers a small amount of liquid to the cup at the top. Therefore, there is no need to worry about an excess of solvents or accidental spillage. There are health and safety advantages to using solvents in this way, as it reduces the evaporation rate of solvents, and reduces potential exposure to solvent fumes. Lastly, it is made of plastic which makes the dispenser shatterproof. Even if you drop the dispenser, it remain as it is without gushing solvents out of it. 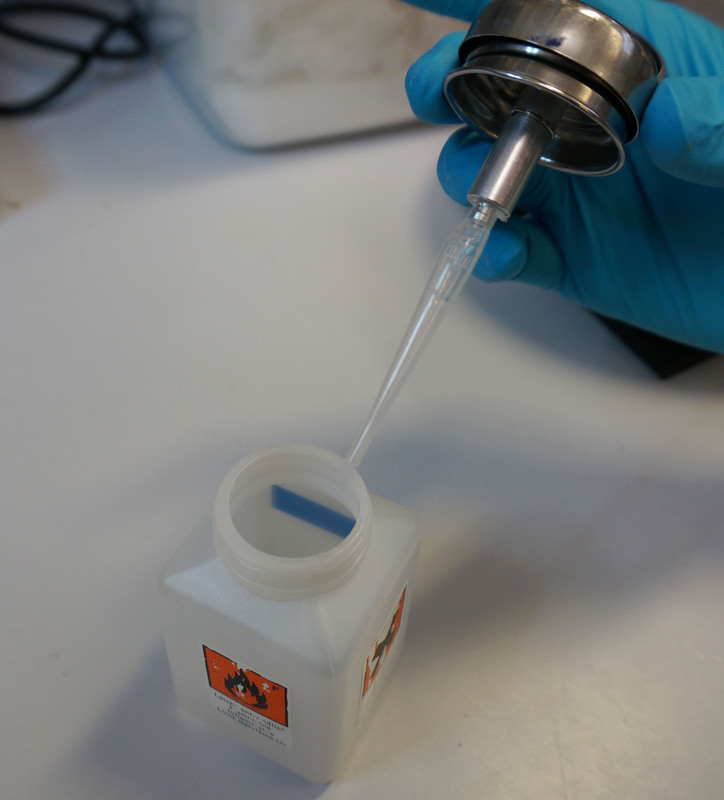 These solvent dispensers are very useful for conservation practice and routinely used in the UCL Conservation lab. So when they go wrong it usually results in a frustrated cry for help. 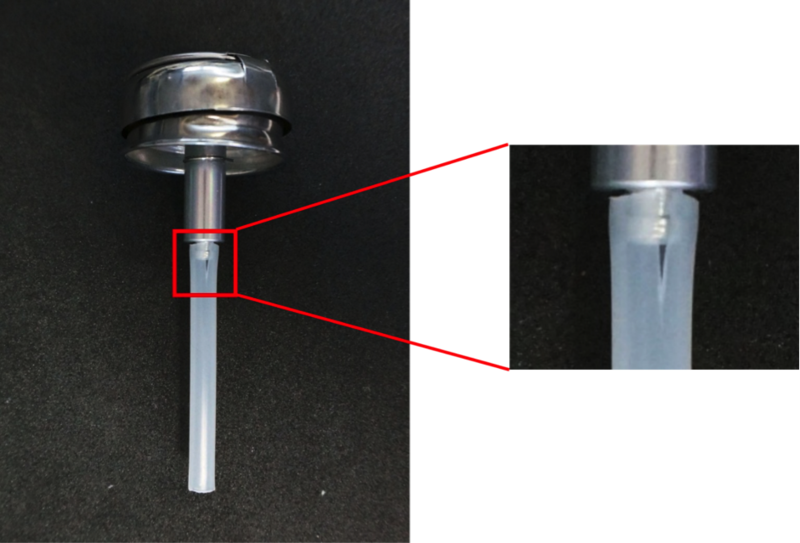 One major drawback of the solvent dispenser, is the durability of intake tube inside the dispenser bottle. I am not sure if this problem applies to all dispensers in the world. However, most dispensers I have used fail to function because of a problem with the tube, rather than other parts of the dispenser. Most of the broken dispensers in my lab have the same problem. So I figured out why so many classmates end up suffering while pushing the dispenser pump to no effect, and then ending up ’borrowing’ other classmates dispensers. It is really annoying that something does not work properly when necessary. In this post, I will let you know how to fix it, with materials that are easily available in your lab or workplace. It is super easy and only takes three minutes to fix . I hope this post helps not only my classmates, but also conservators fix broken dispensers by themselves, and therefore remove one element of conservation lab stressing out. Ensuring you have first carried out a risk assessment, and have access to suitable Personal Protective Equipment and fume extraction, heat a disposable pipette with a hot air gun until the colour of pipette becomes transparent. 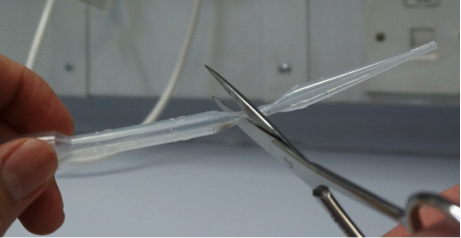 Turn the pipette to ensure that the area is evenly heated. Do not heat just one spot, otherwise the pipette will be burn. In addition, before heating it, you have to consider the height of a dispenser and decide the location of the pipette for heating. 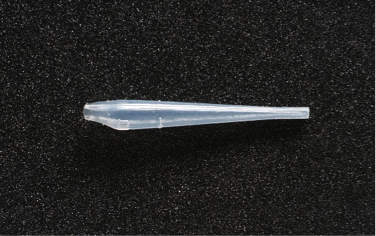 The pipette is made of polyethylene, which is a thermoplastic polymer. The thermoplastic can be soft when heated and hard when cooled. We will take advantage of the properties of thermoplastic. 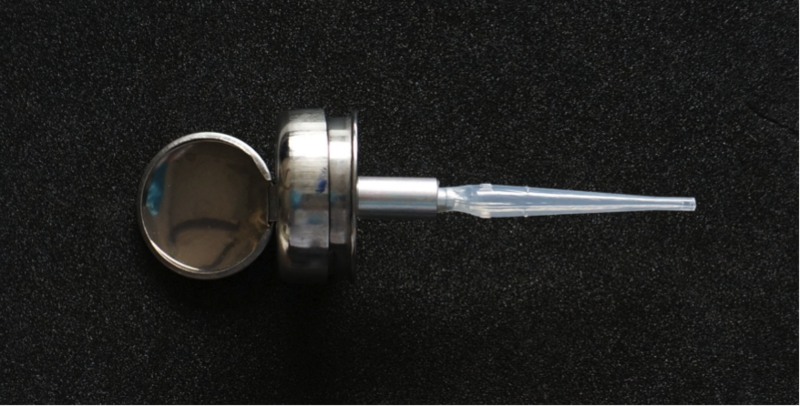 Pull the pipette from both sides considering the diameter of the solvent intake. 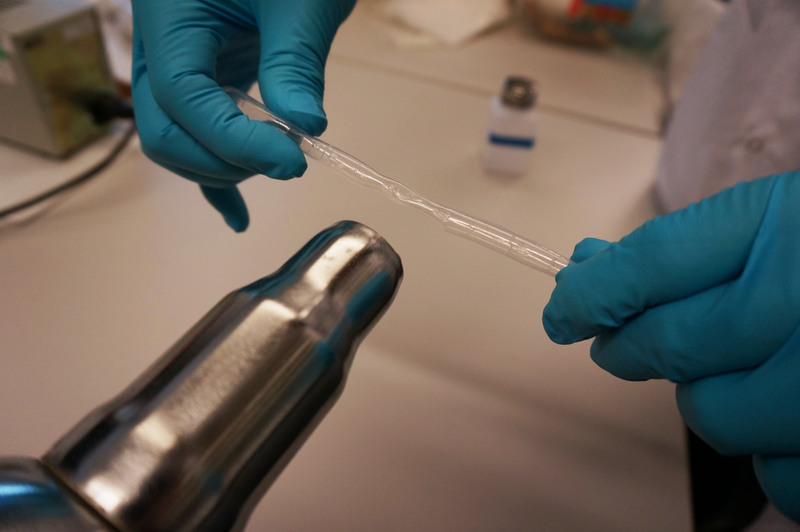 You have to adjust the length of the pipette before it is cooled otherwise it will get hard in a short time so you cannot transform the pipette. Replacing the tube is easier when the tube is warm. Otherwise the tube will get hard and could be difficult to fit it into the intake of the pump. Solvent dispensers with newly made tubes are working well in our lab. From now on, if you find a solvent dispenser broken, do not throw it away, and pinch another from your lab mates. Check the intake tube inside. If it is broken, just spend three minutes to fix it. Just three minutes will make the dispenser semi-permanent and save money (the price of solvent dispenser is usually over 10 pounds!!). The last weeks of term are always a challenge in getting everything finished, but this term one task in particular – polishing SEM samples – took its toll on everybody’s patience. The SEM (Scanning Electron Microscope) is a powerful analytical tool for our work. However, the sample preparation process is rather tedious. Just a quick reminder, a scanning electron microscope uses an electron beam (rather than light with standard optical microscopy) to produce images up to 500,000 x magnification. Although there are several different methods for preparing these samples, our technique involved mounting our samples in resin (Clear Casting Resin POLYLITE 32032-00 from Alex Tiranti Ltd., to be specific), using ice-cube trays as moulds. Resin-cast samples of glass beads prepared by Emily Williams. 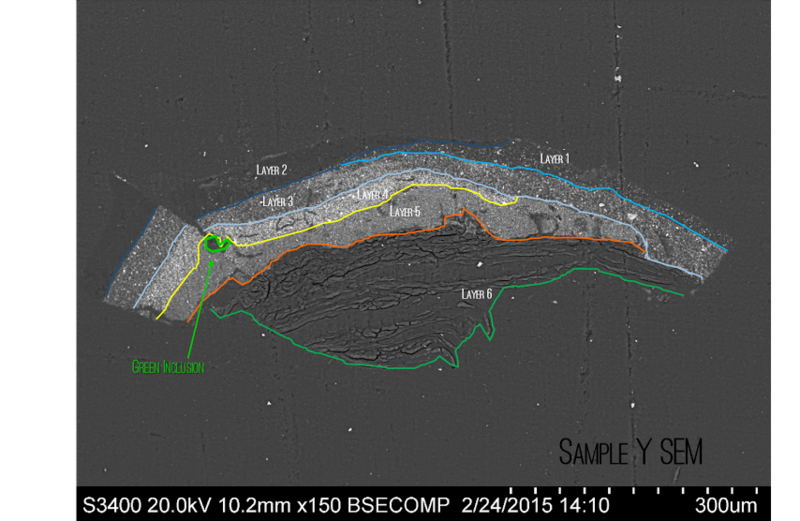 An SEM image of the above sample, as prepared by Emily Williams. The glass appears grey in this image, and the swirls show that the glass was poorly mixed. The white specks in the sample are unmelted metal colorants in the glass. 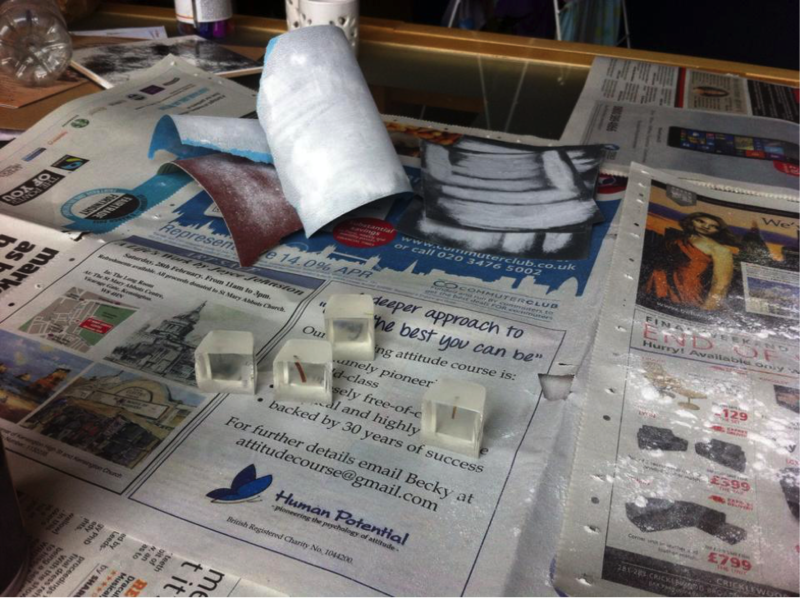 Once cast, the resin block has to be prepared and sawn into the correct shape. This often requires some elbow grease and several sacrificial saw blades. The sample is then polished to the smoothest possible surface. This required four grades of abrasive paper, followed by 4 grades of micro mesh that added up to a good 5 hours per sample. One of the challenges is to make sure you are not left with scratches all over your sample. The polishing work station of Megan Narvey. 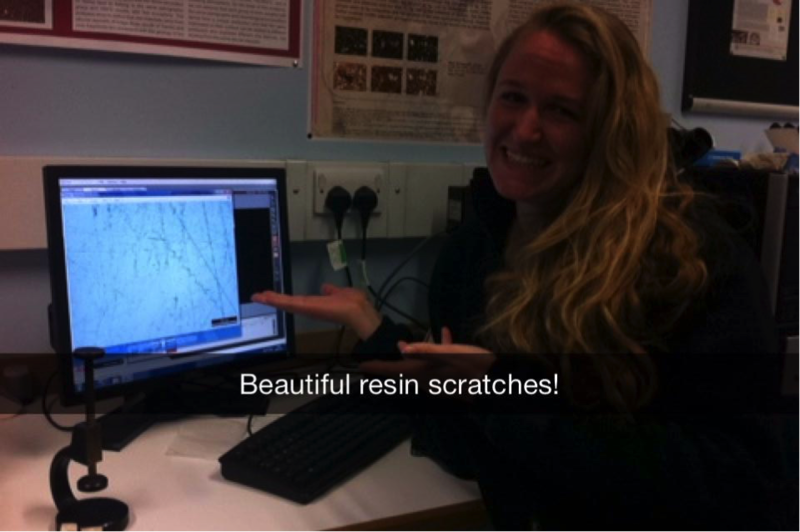 The author and Megan Narvey discovering a significant amount of scratches on their samples. At the end this long process you should have a shiny smooth resin surface, and are likely to have repetitive strain disorder. But if, against all odds, you do succeed in preparing a beautifully smooth surface, the images you will get in return for your labour are really quite amazing! 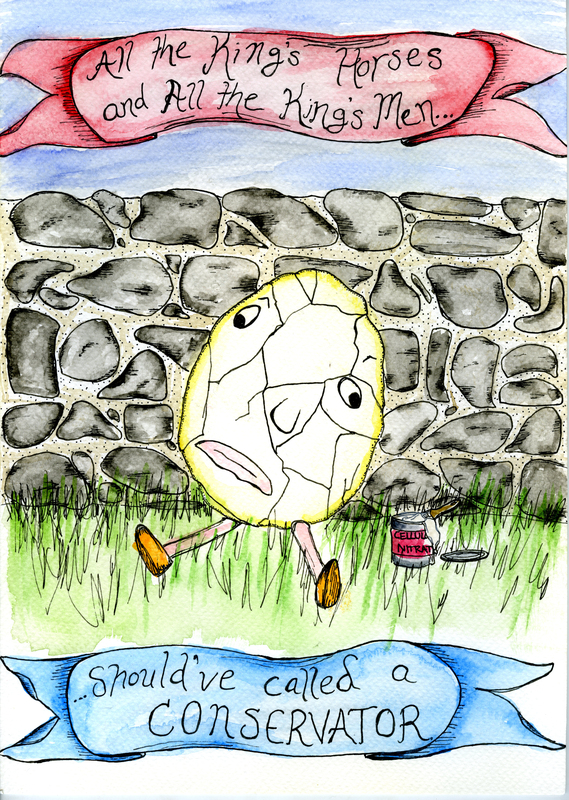 Sample of a cross-section of a painting by Kristen Gillette. Layers 1, 2, and 3 are surface pigments, probably acrylic paints; Layer 4 is a pigment ground layer; Layer 5 is the ground; and Layer 6 is animal skin. Vanessa Applebaum’s cross section of painted plaster along with elemental maps of the sample. The cross section shows the plaster, applied pigment, and a carbonation layer. The elemental maps identify where specific elements are located in the sample. They are, starting from the top and moving left to right: silica, iron, chlorine, calcium, titanium, aluminium, potassium, and sodium. As part of an assigned research project in the conservation materials science course, I was given an unknown bright blue crystalline material. The original context of the sample was unknown, but it was assumed that it was a pigment, possibly Egyptian Blue. Visually comparing my sample to a known sample of Egyptian Blue, it was obvious that they were not the same. In order to demonstrate this, I began investigating this unknown blue using various techniques available to me at the Institute of Archaeology at UCL. Polarised Light Microscopy (PLM) was the first technique that I used to examine the sample. In this technique a prepared sample is illuminated under magnification with polarised light. For comparison, here are the PLM images of the unknown sample and the known Egyptian Blue. Out of all the known samples I analysed, Egyptian Blue pigment had the largest grain size. However, as you can see in these two images at the same magnification, the unknown sample still has much larger grains! The unknown blue has grains at least twice as large as the Egyptian Blue. 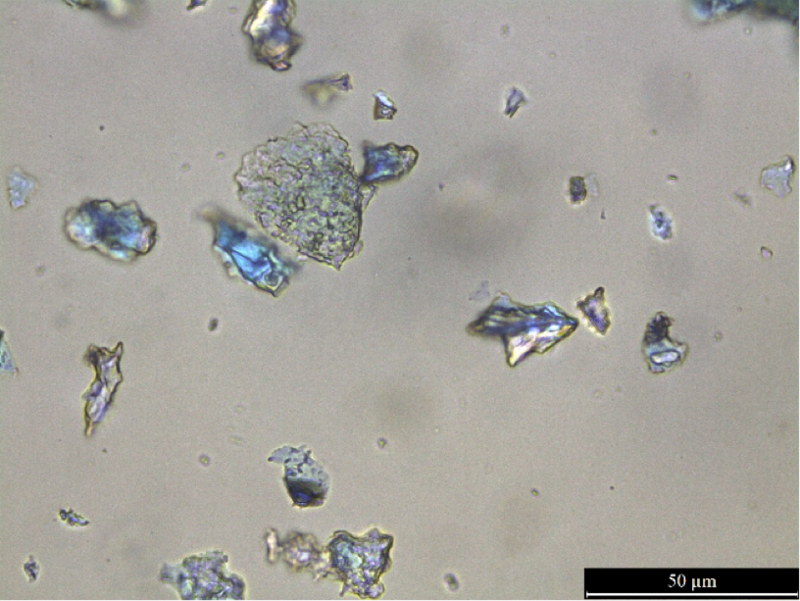 The other known samples of blue pigments in the lab had even smaller grains – smaller than 10 µm in length. I was able to carry out elemental analysis using both portable X-Ray Fluorescence (pXRF) and Scanning Electron Microscopy with Energy Dispersive X-Ray Spectroscopy (SEM-EDS). 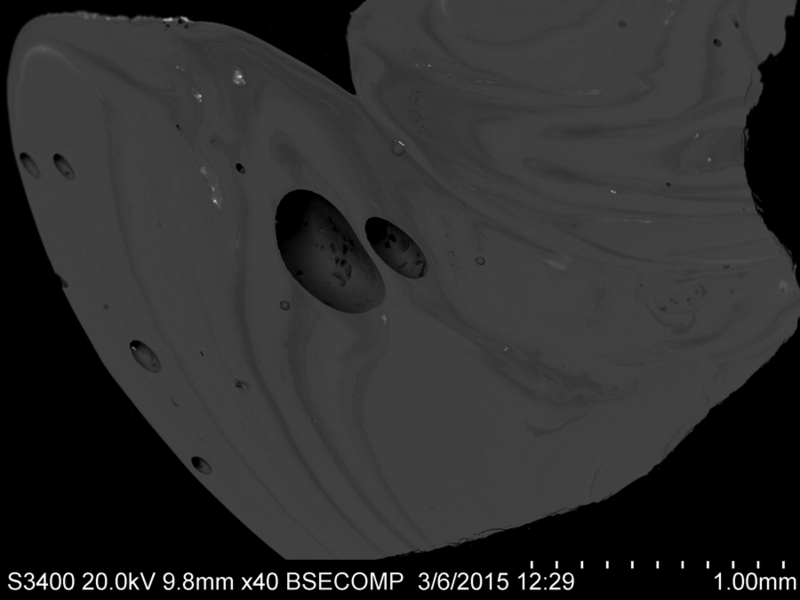 In pXRF, secondary electrons in a sample are excited by bombarding the sample with high energy x-rays. Each element fluoresces differently, making this a good elemental analysis technique. IN SEM-EDS, an electron beam is scanned over the sample’s surface, and the electrons striking the sample produce signals. These specific signals can identify specific elements. 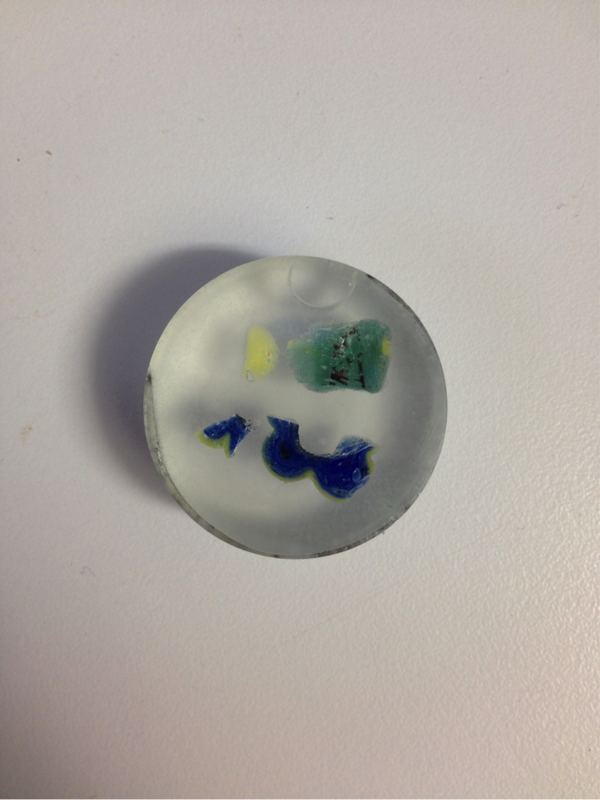 Here are the results for identifying the blue portion of the samples. The elemental composition of the two samples are different therefore, at this point, I believed that the unknown blue was not Egyptian Blue. Now that I had established that the unknown sample was definitely not Egyptian Blue, I needed to find out what it was. For this, I used Energy Dispersive X-Ray Diffraction (EDXRD) to determine the unknown blue sample’s chemical composition. 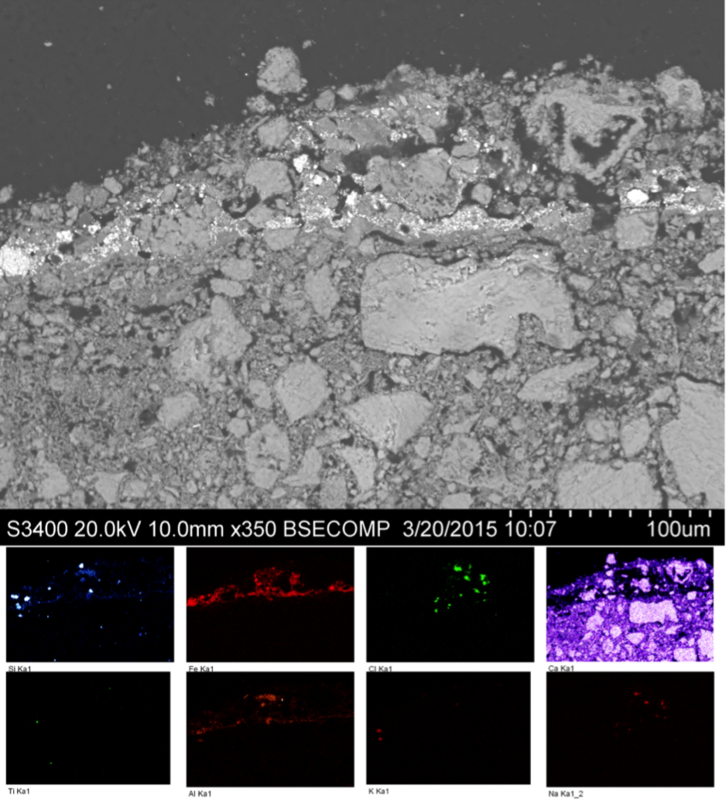 EDXRD uses X-Rays to reveal information about the crystal structure of the sample, which in turn reveals information about the sample’s chemical composition. When I analysed the sample using EDXRD, the ICDD (International Centre for Diffraction Data) database of minerals found a very close match to the composition and crystal structure of the unknown blue pigment: sodium copper carbonate (Na2Cu(CO3)2). 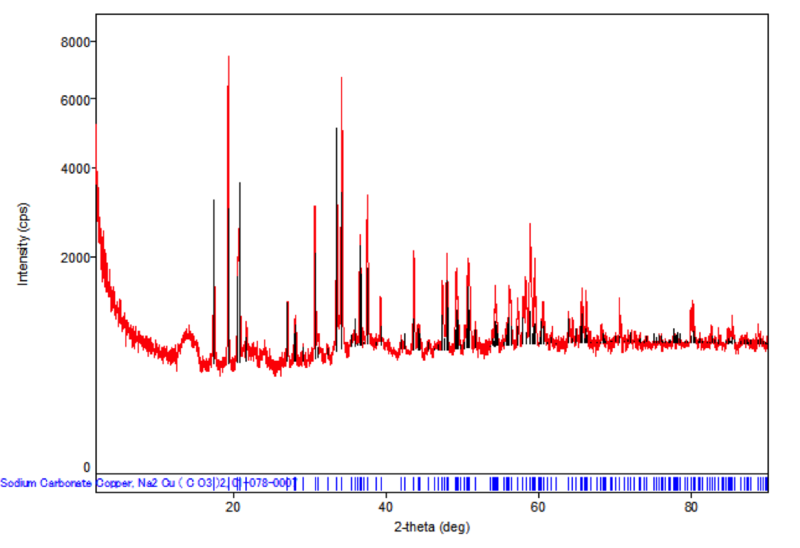 EDXRD diffractogram comparing the unknown blue sample to sodium copper carbonate (Na2Cu(CO3)2). This mineral matched closely to the chemical composition of the unknown blue sample. It also matches the results from the prior elemental analyses. There is a rare mineral of sodium copper carbonate known as Juangodoyite. This mineral was discovered in situ in a Chilean mine in the Atacama Desert in 2003 by Arturo Molina, Iquique. It is formed by the dehydration of chalconatronite, which has the chemical composition of Na2Cu(CO3)2•3H20, and is a corrosion product of bronze. There is no evidence to suggest that this mineral has ever been used as a pigment. Besides elemental and chemical composition analyses, more evidence that the unknown blue sample is juangodoyite is that they both form in crystals and have a bright ultramarine colour. 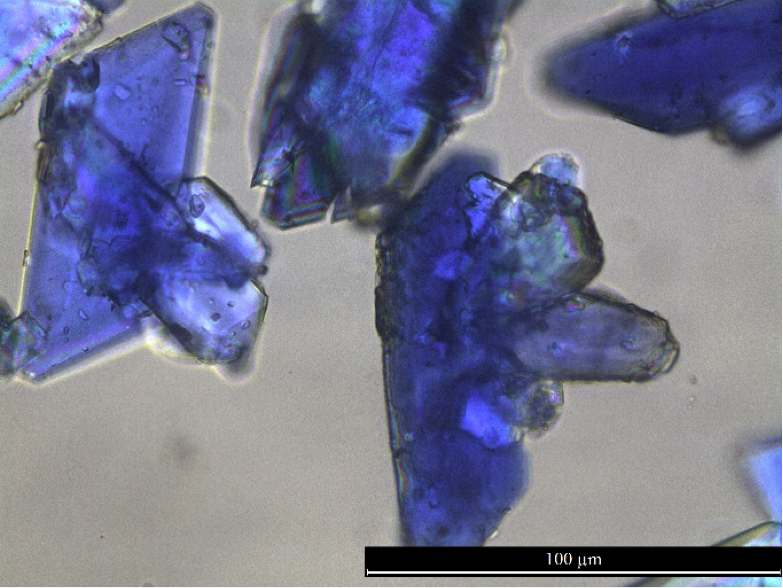 Evidence against the unknown blue sample being Juangodoyite is that the minerals found in the Atacama Desert were 5 µm in grain size, which is much smaller than the unknown blue sample. It’s curious to consider how this rare mineral came to UCL in the first place. Its origin at the Institute of Archaeology is shrouded by age, having passed from one professor to another professor many years ago under the name “Egyptian Blue”. 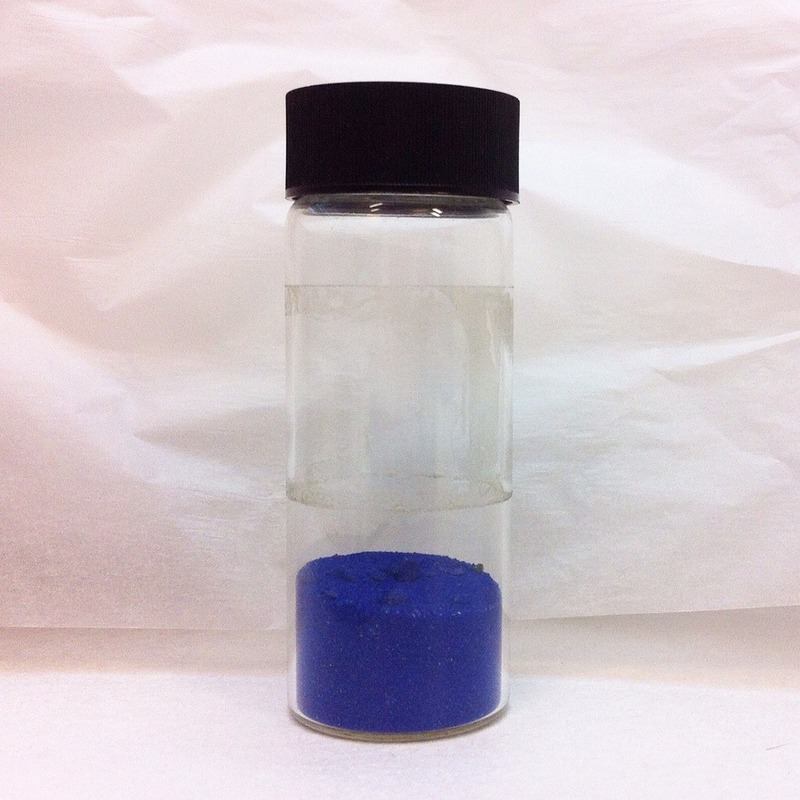 It could have come from one of the Institute’s many international expeditions, or from a previous experiment to create a historic type of blue pigment. There are many possibilities – what do you think?